Week 3 challenges will go out this Friday! Earlier this week I announced our School Visibility Initiative. Challenges for Week 2 (February 9 – 15) have been sent out and, as of this morning, we have 35 different school organizations participating from 14 different states and countries. Awesome! Want to learn more (and maybe sign up)? Every day AWESOME things happen in your schools. Are you telling the world? Is your school using social media to best effect? Are you learning from other school leaders about how to amplify your message and share your stories? Are your communication platforms enhancing your institutional branding, educating policymakers, and building community enthusiasm for future initiatives? Maybe it’s time to join Prairie Lakes Area Education Agency’s SCHOOL VISIBILITY INITIATIVE! If you’re ready to sign up, complete the online form to receive weekly challenges and helpful resources. Challenges begin immediately and you can see the archive of past challenges. Don’t hesitate to get in touch as you have questions! When we take away technology access because of student behavior concerns, we send the message that digital devices and the Internet are optional, ‘nice to have’ components of schooling rather than core elements of modern-day learning and teaching. When we ban teachers from using social media – but not other forms of interaction – to communicate with students in or out of school, we send the message that we are unable to distinguish between behaviors and the mediums in which they occur. When we decline to devote adequate time or support for technology-related professional learning and implementation, we send the message that low-level or nonexistent usage is just fine. When we require educators to go hat in hand to IT personnel to get an educational resource unblocked, we send the message that we distrust them so they must be monitored. When we wag our fingers at students about inappropriate digital behaviors without concurrently and equally highlighting the benefits of being connected and online, we send the message that we are afraid of or don’t understand the technologies that are transforming everything around us. When we make blanket technology policies that punish the vast majority for the actions of a few, we send the messages of inconsistency and unfairness. When we ignore the power of online and social media tools for communication with parents and other stakeholders, we send the message of outdatedness. When we fail to implement hiring, induction, observation, coaching, and evaluation structures that emphasize meaningful technology integration, we send the message that it really isn’t that important to what we do in our classrooms. When we treat students as passive recipients of teacher-directed integration rather than tapping into their technology-related interests, knowledge, and skills, we send the message that they don’t have anything to contribute to their own learning experiences. And that control is more important than empowerment. When we continue to place students in primarily analog learning spaces and ignore that essentially all knowledge work these days is done digitally, we send the message of irrelevance to our students, parents, and communities. Are these the messages that we intend to send with our technology decision-making (or lack thereof)? Often not, but what counts is the perceptions of the recipients of our decisions. What would be your reasoning NOT to connect your students to the world? 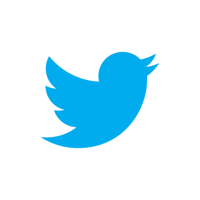 Twitter allows educators to connect and interact with resources, ideas, and people from around the world. 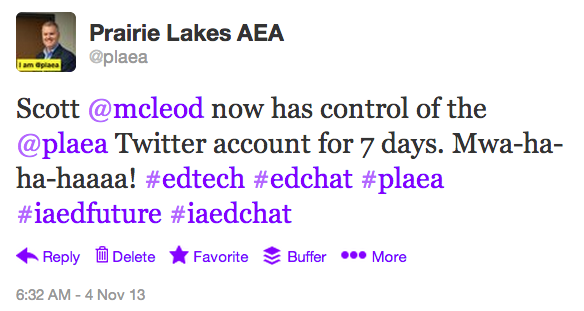 Twitter allows educators to share their stories – positive stories included. We need more positive stories because, I’m telling you, there’s a lot of good going on in our schools – good that doesn’t get shared. Those walls you see around you do not have the power to isolate you and your kids any longer. My question to you: If you have in your hands a tool (phone, computer, tablet + Twitter) that, by just moving your fingers, can connect you, your students, and your communities to resources, ideas, and people from around the world – a tool that can empower kids and educators to learn, create, grow – why would you choose NOT to start using it? What would be your reasoning? 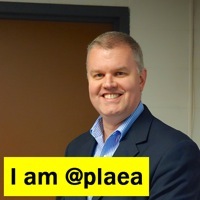 In the grand tradition of Sweden (@sweden), Ireland (@ireland), New Zealand (@peopleofnz), Malaysia (@twt_malaysia), Italy (@i_am_italy), Australia (@weareaustralia), Mexico (@curatorsmexico), Ukraine (@weareukraine), Pakistan (@iam_pakistan), and others, this week I am Prairie Lakes AEA (@plaea)! and much, much more. Woo hoo! Here are a few more links on ‘rotation curation.’ What fun could you have with this idea in your school or district?! Why are we educators having so much trouble mobilizing our voice in ways that are effective? Are we afraid to speak up? Are we ineffective when we do speak up? Do we need to do a better job of marketing? Are we not taking these educational and policy changes seriously enough yet? Do we not have a viable and compelling counternarrative? Are we so downtrodden that we feel that any efforts we make to speak up are pointless? Are we simply getting outspent by those with deeper pockets? Why can’t we tell our story in ways that resonate with others? And why are most of us unwilling to even try in the first place? I’ll keep adding to this collection. Special thanks to Patrick Larkin, George Couros, Lyn Hilt, Chris Lehmann, Dan Frazier, and others for helping me expand my existing list. If you’re maintaining a Twitter list of P-12 educational administrators that I should know about, or would like to chat about creative ways to use these lists, get in touch! How often do we techno-enthusiasts sound like this when we proselytize to less tech-savvy educators? I think I’m going to be on NPR’s All Things Considered today as part of its All Tech Considered segment. I was interviewed last week about the New York City Schools’ new social media policy for employees. Regular readers know that I’ve written about this in the past. If I am featured on the show, I’ll add the link here afterward. If you hear me, let me know what you think! UPDATE: Here is the NPR All Things Considered story and the New York Times SchoolBook story.